In a time of heightened competition from new business models and outside disruptors, brokers have an opportunity to solidify their standing in the marketplace by participating in RISMedia’s 30th Annual Power Broker Survey, the real estate industry’s longest-running, most widely-read ranking of the nation’s top residential real estate brokerage firms. The 2018 Power Broker Survey ranks firms by residential sales volume and closed transactions for 2017. The deadline to complete the survey is Feb. 19, 2018. To participate in RISMedia’s 2018 Power Broker Survey, firms must have completed a minimum of $150 million in residential sales volume in 2017. If you participated in the survey last year, you will receive an email invitation with your firm’s unique link for completing the survey. If you are new to the Power Broker Survey or do not receive the invitation, please click here to complete the survey now. RISMedia’s Annual Power Broker Report & Survey is the industry’s preeminent report ranking the nation’s top real estate firms. Appearing as one of the top firms in the report serves as an important competitive differentiator for U.S. firms of all sizes. The Top 500 Power Broker Firms ranked by sales volume will appear in the April 2018 issue of RISMedia’s Real Estate magazine and online at rismedia.com. The Top 1,000 firms, ranked by both sales volume and transactions, will be available later this spring. Being recognized among the country’s top brokers in the Power Broker Report serves as an important recruiting and retention tool for today’s leading real estate firms; it also helps secure relationships with today’s more discerning real estate consumers. Brokers who make the Top 500 ranking in RISMedia’s Power Broker Report will be invited to gather at RISMedia’s annual gala, The Power Broker Reception & Dinner, taking place this year on Friday, Nov. 2 in conjunction with the REALTORS® Conference & Expo in Boston, Mass. To complete the survey, firms must have completed a minimum of $150 million in sales volume in 2017. The survey should be completed by an individual, shareholder or entity with a minimum of 50.1 percent ownership interest inclusive of subsidiaries. If you completed the survey in 2017, you should have received an email from RISMedia with your own unique link to complete the survey. If you did not receive this email, click here. For your survey to be accepted, please be sure to check the boxes on the verification page and make sure it is signed by: 1. Your broker, and; 2. Your CFO, accountant, or other party who can validate that the data submitted is correct. There is no cost or any obligation to participate in this report. The deadline for RISMedia’s receipt of your completed survey is Feb. 19, 2018. To take the survey now, click here. 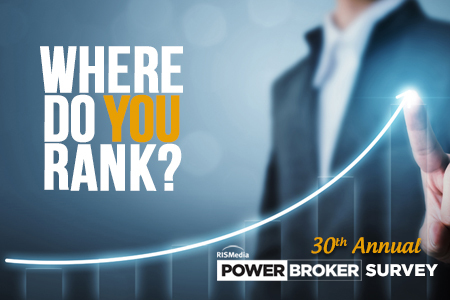 For questions regarding RISMedia’s 30th Annual Power Broker Report & Survey, please contact Executive Editor Maria Patterson (maria@rismedia.com) or IT Manager James Jones (jim@rismedia.com).